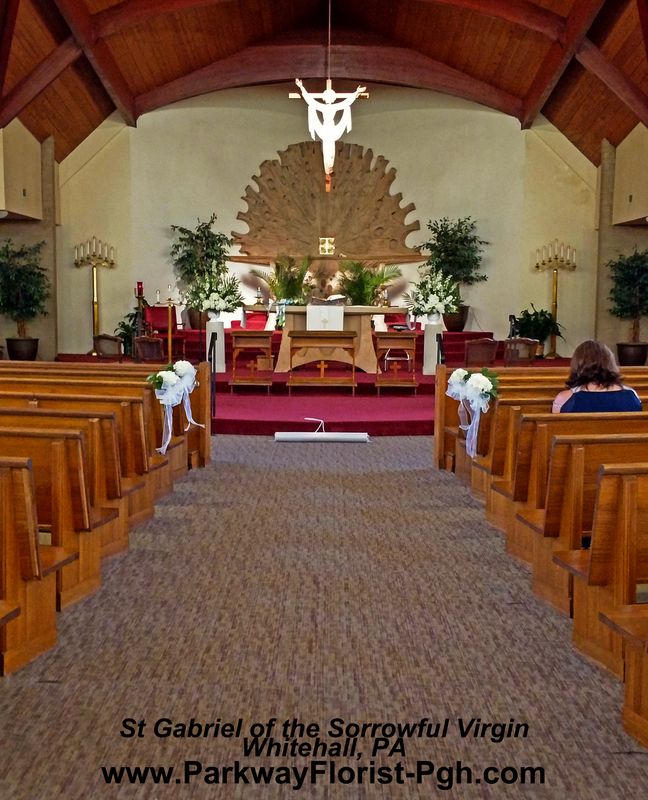 Carina and Anthony’s wedding at St Gabriel’s Church in Whitehall, PA was the 2nd wedding in recent years for this family. Carina carried a traditional cascade of all white flowers. Her Matron of Honor was her older sister, and our former bride! 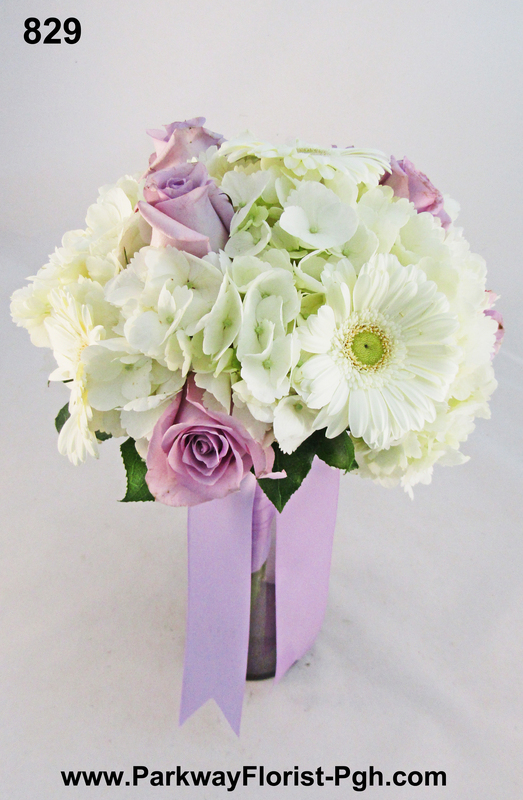 She wore lavender and carried a bouquet with lavender roses, white Gerber daisies, and other white flowers. 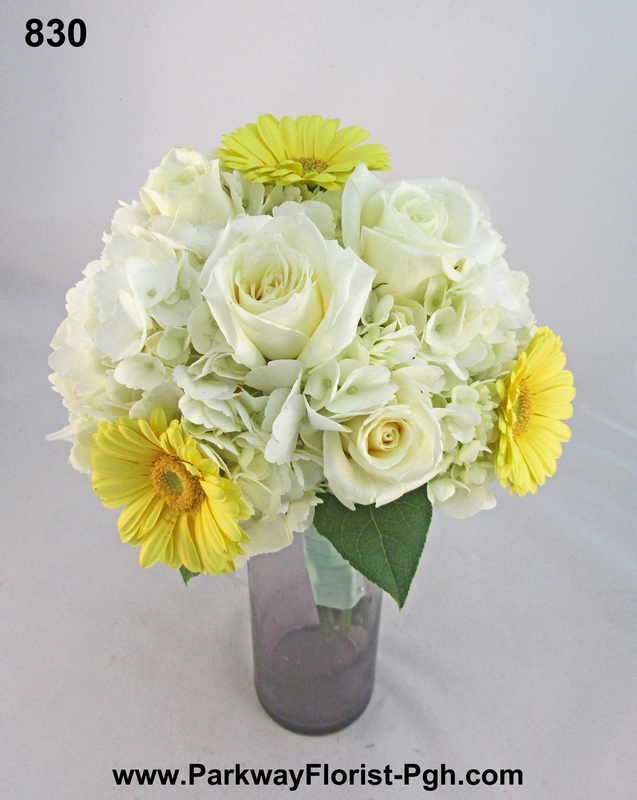 The bridesmaids wore mint dresses, and carried bouquets of pale yellow Gerber daisies, white roses, and other white flowers. 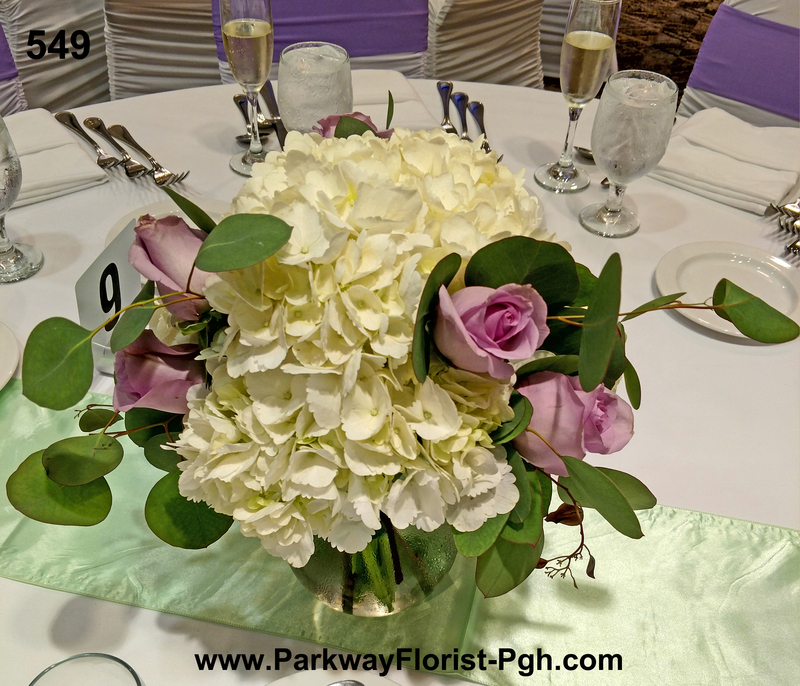 The ballroom at the Pittsburgh Airport Marriott where the reception was held was tastefully decorated with alternating centerpieces. One held white Dendrobium orchids, while the other had white hydrangea and lavender roses. 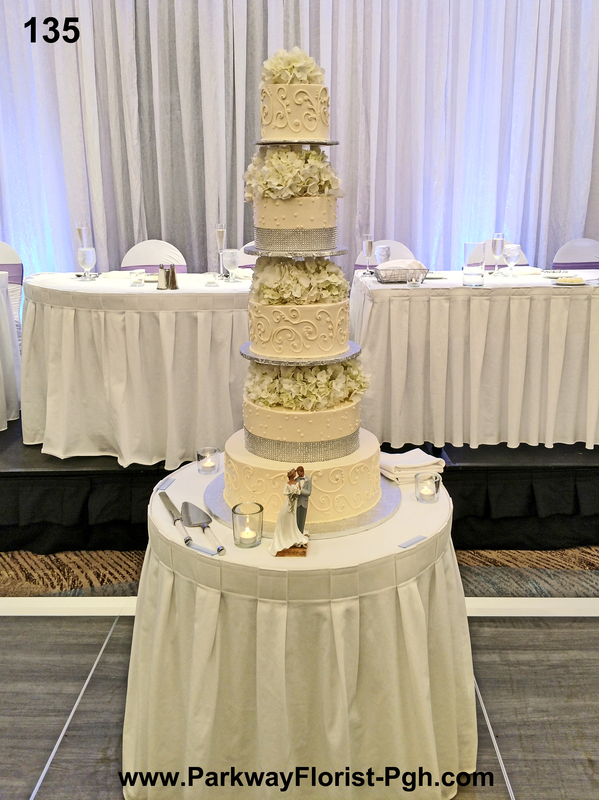 The V-E-R-Y tall 5 tier cake was accented with white hydrangea. Congratulations to Carina and Anthony! Thank you for allowing us to help you on your big day. 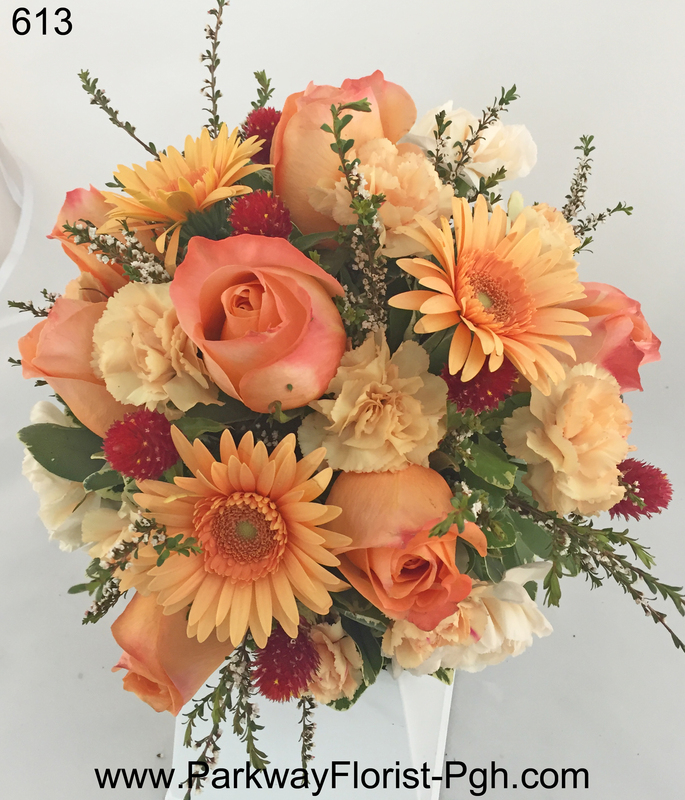 This entry was posted on June 21, 2018, in Ceremony Sites, Exploring Colors, Gerber Daisies, Weddings - 2018 and tagged bouquets, bridal bouquet, bridesmaid, bridesmaid bouquet, centerpieces, church flowers, couple, wedding, Wedding Centerpieces, wedding flowers. 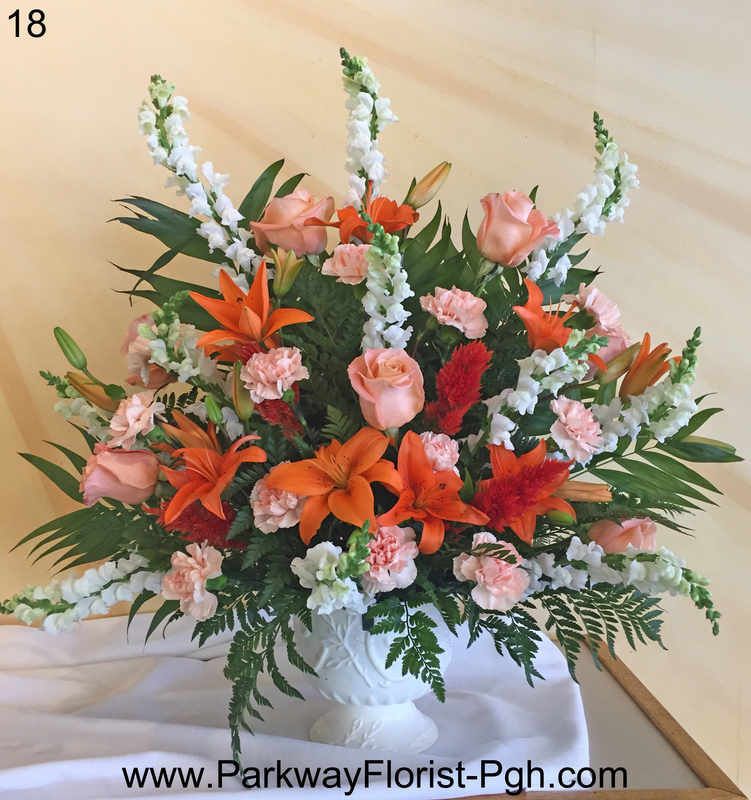 The hustle and bustle of wedding season has been keeping us busy at Parkway Florist. We are so grateful to have worked with so many wonderful families this summer and are excited to see what the rest of 2016 will bring our way. This past weekend was quite a colorful one in our shop! Nothing gets you into the fall spirit more than delightful oranges, yellows, and reds. Despite the hot and humid weather on Saturday, the colors for these weddings got us in the mood for crisp fall air, and sweet apple cider! 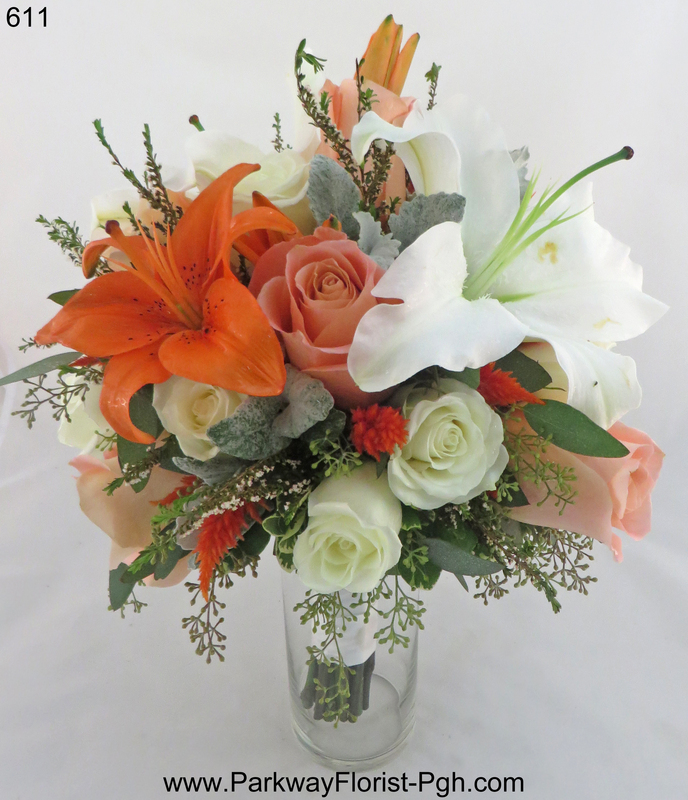 Our first bride carried a variety of flowers including orange and white lilies, coral and ivory roses, orange celosia, seeded eucalyptus, and dusty miller. The bridesmaids and junior bridesmaid had coordinating bouquets which featured gerbera daisies, mini carnations, roses, gomphrena, and cottage yarrow. 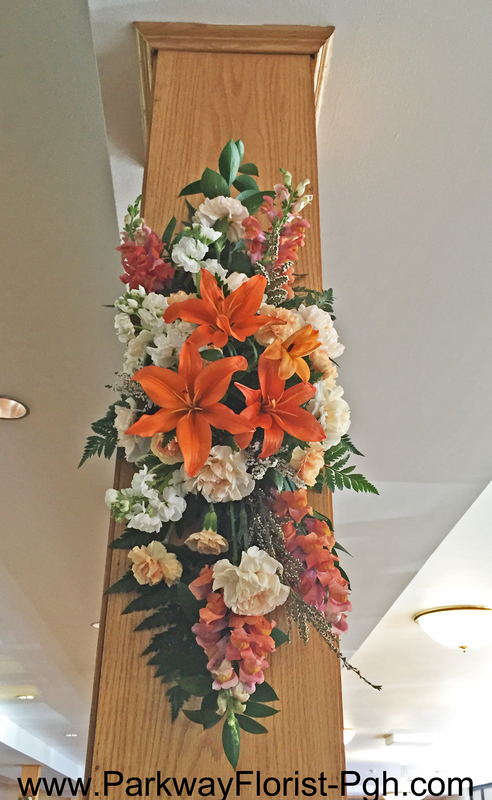 To decorate the church, we used two larger arrangements on the altar as well as eight smaller arrangements that were hung on the columns that line the isle. 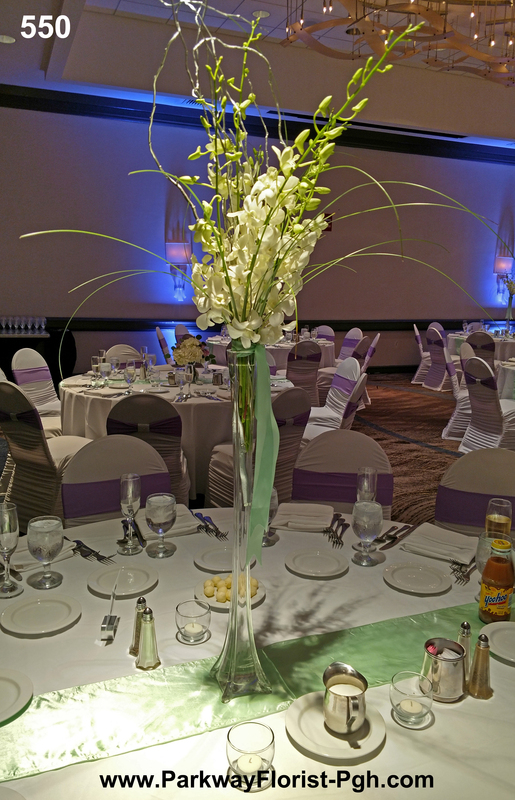 Many similar flowers were used throughout to create a unifying color scheme and atmosphere for this wedding. 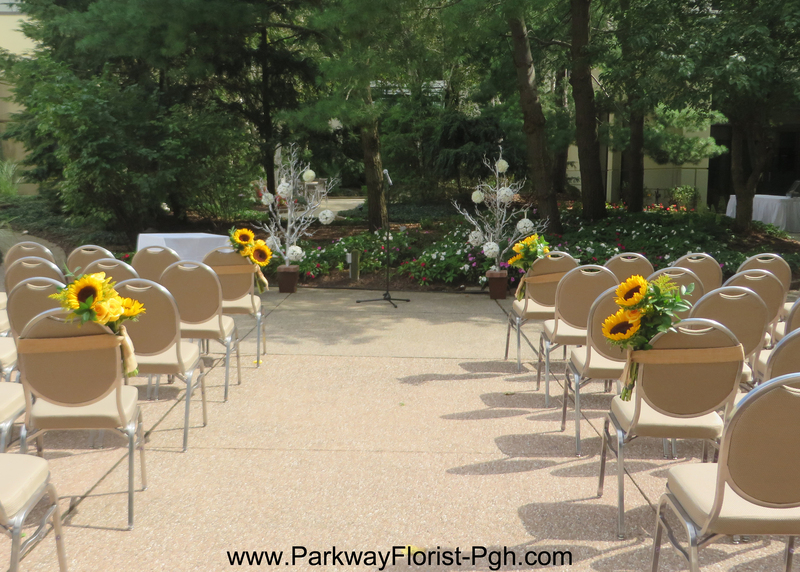 Continuing on with bright fall colors, we had a beautiful wedding take place in the courtyard garden of the Pittsburgh Airport Marriott. 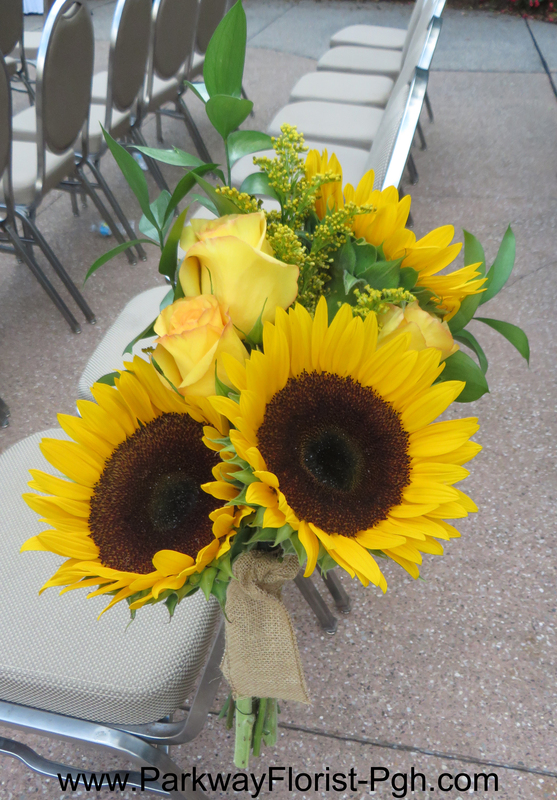 Sunflowers and roses decorated the isle to create a perfectly romantic atmosphere for a wedding ceremony. 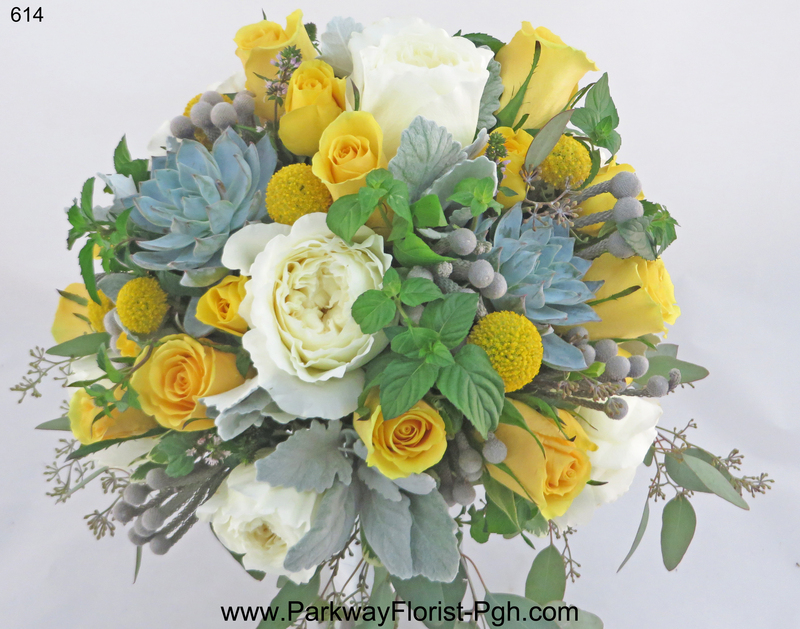 The bride’s bouquet was a beautiful assortment of ivory garden roses, succulents, yellow roses, craspedia, brunia berries, seeded eucalyptus, dusty miller, and mint leaves. The bridesmaids carried clutches of yellow calla lilies and the groomsmen each wore a yellow calla lily boutonniere. Let’s see what the changing season brings us this year! 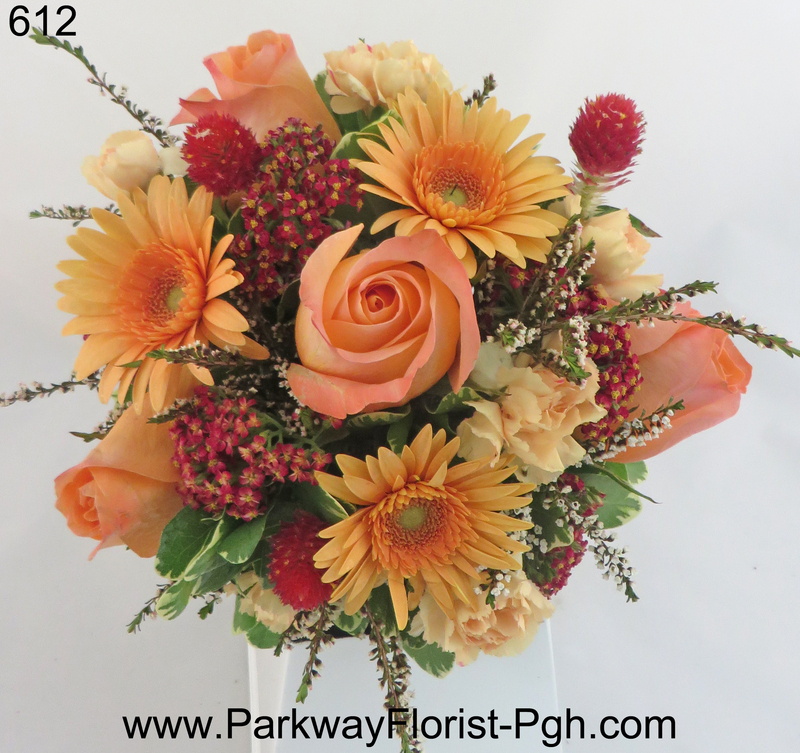 This entry was posted on September 12, 2016, in Weddings - 2016 and tagged boutonnieres, bride bouquet, bridesmaids, church flowers, church wedding, fall flowers, fall wedding, orange flowers, pittsburgh, Pittsburgh Wedding, pittsburgh wedding flowers, summer wedding, sunflowers, wedding flowers, yellow flowers.